It's books like this one that make me wish I had a little one at my beck and call...to sit and snuggle, to talk and reread, to think and think again about what there is to see in the inviting world that Lizi Boyd has created. 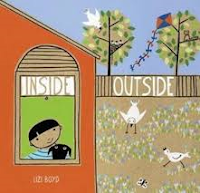 It is an opportunity to explore a world separated from inside and outside by a window that allows the child to be part of both of those worlds. There is so much for a child right at home. All it takes is curiosity, observation and a plan to get outside. 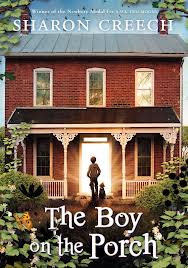 As the venue for this young boy's exploration moves from inside the house to outside on alternating pages, a rapt audience will see what happens when he brings the outside in. All that is inside is natural and organic, coming straight from the time he spends in the glorious outdoor world found in his own backyard. As the boy moves through the door from one world to another, there is a celebration each time of all there is to see and recapture in one place or the other. While snowmen still peek through the window, the boy is busy potting seeds that will soon be ready to be put in the garden. Then he goes outside to add to his snowman family. Spring showers bring a playful turtle up from his winter home to find a place in a readied bowl for indoor observation. Warm weather invites outdoor play and a reminder that a little sailboat would be a welcome addition to the variety there. Inside he goes, to make one. The joy is found in these seemingly simple visuals created on brown craft paper; but, so much thought has been given to every image created to fill the double page spreads. A die-cut window can be found on every page offering readers a chance to speculate on what might happen next, what has happened before, and encouraging discussion at every turn. "Children are brilliant in their imaginary worlds. I’m envious of their eye, strength of images and prolific naivety. Their physical worlds are also filled with stories and some children become keen observers and in turn narrators. We, the adults, nurture our children and allow them the quiet to explore. Seeing and telling stories is a part of all our lives. It is through stories that we amuse, share, comfort, connect. Imagine being given a long scroll of paper, a bamboo pen, a bottle of ink and being asked to illustrate your days. It would be your own pictorial mapping; ancient , modern, timeless." "I know, I know, I know! I'll be a dance teacher!" she knew it was a great idea. Teachers never have to perform. No stages. No shows. No audience. No ice pops." Her parents are aghast and remind her that she loves dancing. Yes, she does. It takes but a moment for them to realize the source of the conflict...it's the recitals! They take all the fun out of it for Lexy. She has a desperate case of stage fright. Finally, she's letting the world know. "Now, let's be clear about one thing. Giants? Yeah, they don't dance. They stumble and they stomp and they stretch and scratch, but that's not exactly dancing. That's why it was so weird when five of them showed up at Lexy's house on Saturday morning and bellowed, "DANCE LESSONS, PLEASE!"" Lexy is not happy, and she is also not easy to convince that these are just the students she needs. Without experience, she finds to difficult to determine where to even start with them. The only way to do it is to get right to it...and that is what she does. She turns giant blue beings into skillful, accomplished dance students, all in preparation for an upcoming recital. What? A recital? What will happen when the curtain opens? You will need to get a copy of this charming and full-of-fun new book to discover that for yourself. 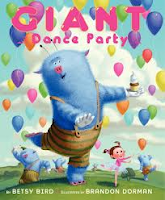 They'll be dancing in the library when you share this book...or, they will be wanting to do just that! The story is told skillfully with Betsy Bird's young audience in mind. It's fun, and funny! The digital art created in bold color and seen from frequently changing perspectives will keep listeners entertained and begging for more. On with the dance! with always being so proper. 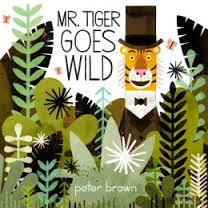 Oh, Peter Brown! You do such brilliant work! Mr.Tiger is disgruntled with the way things are. It's all so polite and well, boring. Only Mr. Tiger brings color to his drab and tedious surroundings. While he is decked out in the very handsome attire that is expected of his Victorian surroundings, he has color in his face and paws...a glorious tangerine shade that stands out from the rest. Even his speech bubbles have color. "Mr. Tiger! If you must act wild, kindly do so in the WILDERNESS!" That is exactly what he does. When loneliness rears its ugly head, he faces making another life-changing decision. He returns to his friends, and finds that things are no longer so staid and uppity. He is now a much happier tiger than he was before turning to his wild ways! Anyway, I knew I wanted to use watercolor for Mr. Tiger. Watercolor is just inherently beautiful, the little swirls and imperfections make it interesting and organic, with lots of happy accidents and gorgeous mistakes. But I didn’t want to do traditional watercolor paintings, I wanted the illustrations to have bold shapes with interesting patterns and rich textures, so I had to come up with my own way of using ink and watercolor. Instead of making tons of little pencil drawings, I made tons of little watercolor and ink shapes (as well as a few pencil drawings and handmade textures), and scanned them into Photoshop where I colored and layered and combined them into the finished illustrations. It took a while to figure out my new technique, but I’m pretty happy with the finished result." In this lovely book about the many emotions that human beings feel, Linda Ashman takes a light look at how we can deal with them in a setting meant for preschoolers. Not intended to be smug or self-righteous, it is rather a happy look at what happens when children are together. Sometimes they are annoyed, frustrated, sad, angry, even jealous. It happens. 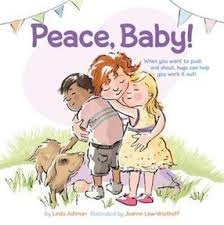 Peace, Baby opens the dialogue that may help them deal with situations as they arise, or even just to talk about the many ways they feel. I love that this book encourages us to act in peaceful ways; there seems to be so much anger in the world....honking horns, irritated huffs in waiting lines at the grocery store, strong and unreasonable reactions to the most innocent actions. 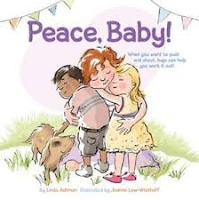 If those who are older than the little ones for whom this book is written set a stage for peaceful response, what kind of change would we see in the world? The rhythmic patterns of the described events add fun and enjoyment. The repetitive refrain 'Peace, baby!' offers little ones a cheery response. It is calming, while also providing a happy atmosphere for sharing those little annoyances that sometimes get in the way of being a friend. And, it's not just for little ones. We all need to think seriously about our own responses to life's little dramas! The gentle, warm feel of the watercolor illustrations done by Joanne Lew-Vriethoff add their own sense of quiet peacefulness. 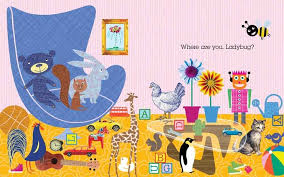 The pastel colors, the expressive and caring children, and the various familiar settings encourage readers to pay attention to the action and reaction on each double page spread. They are as light and airy as the solution to each of the dilemmas, and that is a good thing! "Mama never did escape the damage done to her reputation after taking that ride downtown. Despite the promises of equal opportunity and protection under the law, so rich in the air in 1969, that night her arrest record got all shuffled up with her social-services record, and soon the childcare she got so she could go to college was canceled, and with it her courses, and Mama went back to the school of hard knocks." 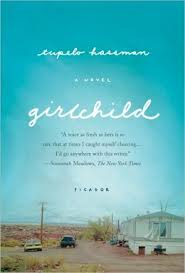 I could not put this book down, despite my aversion to its heartbreak. There was also humor which gave my heart and mind a much needed release from the sorrow that Rory faces on a day-to-day basis. She lives there with her mother, who is ill-equipped to care for her. Her life is one of poverty, fear of social services and worry about being from 'feebleminded' stock. Johanna, her mother, is a bartender at the Truck Stop, who drinks too much and has lost her first four children...all sons who soon found their way out. Her mother's mother, Shirley Rose, has her own demons, although she is caregiver to Rory while Johanna is at work. Shirley Rose provides some sense of stability for her granddaughter. She wants Rory to be the one to break the mold, and she believes that she can be. Rory is a terrific student, and brilliant. Will it help her find her way to a different life than what plagues the women in her family? When Shirley Rose moves away, Rory (at 6) becomes the victim of a neighbor girl and her father, the Hardware Man. When he finally leaves the Calle, Rory is left to find guidance in a battered copy of The Girl Scout Handbook. She learns needed life lessons, and she learns to take care of herself and become the person she wants to be. She is wise beyond her years, capable of letting go of misconceptions about the life she is destined to live, and able to take all that is good from her experience to change her path. "Take this one to the bank: birds are hatched from eggs and are always egg-shaped. Maybe there's no escaping the shape that molds you, no getting around how you got started even if you do break out. I haven't found a mirror yet that doesn't reflect the curves of the Call back at me, my dirty ways, my fragile teeth and bad skin, my hands that won't stop picking at themselves. The Girl Scouts win again. And maybe V. White does, too. Except for one thing. Wings are born from that shape. They don't come from any other." "I don't even think I breathe when we're not together" she whispered. "Which means, when I see you on Monday morning, it's been like sixty hours since I've taken a breath. That's probably why I'm so crabby, and why I snap at you. All I do when we're apart is think about you, and all I do when we're together is panic. Because every second feels so important." My friend Helen asked me what I thought of this book, and if I thought she should give it to her granddaughter as a birthday gift. At the time, I had only heard small inklings about it through other bloggers and a journal review. I had it on order so that I could check it out. Within a week, it was at my door and within a day, I had finished it....totally immersed in Eleanor and Park's world, captivated by their incredible characters and mesmerized by Rainbow Rowell's writing. It is the second book this year that I will surely read again! (The other is Code Name Verity.) Oh, my!!! When Eleanor boards the bus bound for her new school, she is noticed. She has bright red crazy hair, wears clothes that speak of her individuality and she is 'big and awkward'. Everyone else has a seat already...one that would be theirs for the school year. There is nowhere for her to sit. Park is the only one willing to move so that she can sit down. He is not happy, and pays no attention to her. That is their beginning. 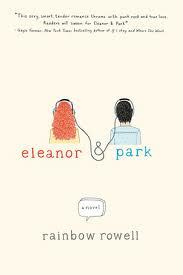 Every day after that, Eleanor sits with Park and they soon find that being together is much better than being alone. She likes the comics he likes. He makes playlists for her, and then gives her batteries so that she can listen to them. Their relationship grows stronger daily, and is very powerful and heartfelt. Their two families are a study in contrasts. Eleanor is terrified of her abusive stepfather, for her siblings and herself. She attempts to avoid him at all costs. The family is poor; Eleanor cannot afford the batteries she needs to listen to the music she loves. She creates her own outlandish outfits from castoffs and used clothing shops. Park's family is loving, supportive and eventually welcoming to Eleanor. There should be no relationship in the eyes of the world they live in. Eleanor doesn't fit the mold of the American teenage girl. Park is outside the norm with his biracial heritage, his eyeliner, his love of music and comics. They should not fit! But, they do. They take small steps toward each other, growing and changing with each new experience that they share, or do not. I love their astute observations, the way the author describes their growing love for each other, the 1980s Omaha setting, and their innocence. Rainbow Rowell does such justice to her characters; offering ever-changing points of view, giving them strength that can cause conflict with the other, allowing them to grow slowly into a meaningful relationship, and leaving them forever memorable to those who read their story. I could not write this post earlier...I needed to live with Eleanor and Park in my memory for a while before telling you that reading about them is one of the great pleasures of my reading year. You need to know them, too! "Laid out on the table in Papa's work area were several wooden cigar boxes. Each one had various items placed inside it. The inside of one box resembled a landscape, another a city. One looked like a funny face with mismatched watch dial eyes, a doorknob nose, and a black plastic comb mustache. The boxes were in different stages of completion." "It dawned on him. Ms. Silver thought he was making fun of her. She thought that the two red markers were meant to be her two red chopsticks. She thought that the ugly face he'd made at Emma was an imitation of her, Ms. Silver. Billy didn't know what to do." "Before school, Billy gathered the following: a nickel, a dime, a quarter, a paper clip, a safety pin, and a nail. Each of these things was silver in color and each would be a gift for Ms. Silver. Billy wanted one thing more, something better somehow, something important, to add to his collection. When he was sitting on the edge of his bed putting on his shoes, he found it." "It was strange, but already he felt less afraid. How could a three-year-old make him feel safe? Especially one who was mostly asleep. Although part of him knew there was no monster under his bed, he did not want to go back to his room. He wanted to stay here." 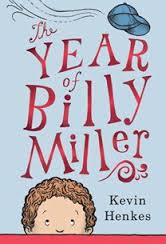 In the final section we learn a bit about Billy's mother; his choice for a poetry assignment is to write something about her. It is not an easy task. But, he perseveres and manages to create a poem that his mother loves and that captures her essence. Then he shares it in an end-of-the-school-year show. This is a book that should be read out loud to your children or your class. It is destined to be a classic, and maybe you heard it here first! Quietly familiar and real, there is much to love about it. It is indeed Billy's year, and you should share it!! "She knew the answer, even as she wondered: People get distracted by worries and sadness, and have to struggle to see anything else. They have to work hard to hold on to beauty, to hold fast to dreams and words; like Sum, who seemed to grow more fragile with each passing day. Early knew she had to hold fast for three and dream for them all, at least until Dash came home." "At 4:44, the police received a 911 call from a phone booth in the South Side neighborhood of Woodlawn. A muffled voice reported an accident involving a bicyclist and an unmarked delivery truck. When a squad car arrived at the scene minutes later, the street was deserted. There were no witnesses to be found. No one could remember seeing the young man that afternoon, but there were his bike, his groceries and his pocket notebook, which was discovered beneath a nearby car. He had vanished three blocks from home." "By the end of the 2012 school year, an estimated thirty thousand children in the city of Chicago were without a home. This number does not include those living in the surrounding suburbs, and is thought to be low. What does thirty thousand look like? Count out thirty pennies and pretend that each one has a name. Now make one thousand groups of thirty pennies. These are our children." It is a powerful story, told eloquently. In careful, beautiful language Blue Balliett shares this family story of love and loss, hope and despair. There is a mystery to be solved, a city to be navigated, the family to be bolstered, and Langston Hughes to help Early through it all, thanks to her father's tutelage and love of Langston's words. Life in the shelter proves difficult in many ways. We see through Early the family's experience there: the lack of privacy, the long line ups for everything from using the telephone to getting a meal, the noise that happens when so many live in one place, the lack of resources. We also see the goodness of those who try to help with donations of clothing, personal care items, food and time to tutor the children who are falling through the cracks. It is bleak. 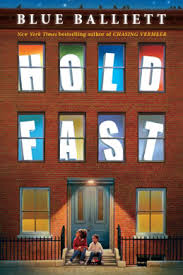 Early is a tremendous character, holding fast when hope seems lost, helping her family when her father is not there to do so, and letting readers see that strength and determination make all the difference when faced with adversity. You will not soon forget her! "It was arriving at school that Ben hated. Sadly, Adrian Underbite, perhaps the world's largest third-grader, didn't seem to like Ben very much. But Adrian did like nice things." Ben is soooo happy with his new bike. It gives him independence and great joy to ride it to school...any which route he chooses to take. The problem is not in going to school, it is in arriving there. His arrival means facing Adrian Underbite, who takes great pleasure in relieving Ben of the beloved bike. That means a long walk home at the end of the day! While on his way, he hears a strange sound which appears to need investigating. Guess what he finds? His bike hanging from a tree limb, and Adrian doing the same. Adrian's plight is more precarious. Ben wants to just walk away, and leave Adrian to his fate. He can't do it! Instead, he quickly returns and risks life and limb to ensure the bully's safety. There should be a reward for such selfless concern for another person, shouldn't there? It appears that is not to be the case...or is it? 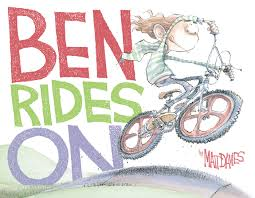 I think that kids will really like Matt Davies' first picture book! His artwork is such fun, filling the pages with movement, sight gags (check out the shark fins), exaggerated characters, an ever-present crow, and a tale of bullying and bonhomie. He provides engaging and amusing perspectives, terrific expression on the part of both bird and human characters. I kept going back to take in all that he includes in the visuals. There are no parents evident to help Ben or Adrian choose to make the decisions that they make. It is important for young readers to see themselves in situations where their independence and ability to deal with apparent difficulties are left to them. 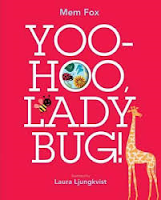 Dramatic, humorous, energetic and joyful are words that came to mind as I read this book to myself and then aloud...and will certainly read to others whenever the opportunity presents itself! "The reefer car is snug and cold. like a rolling ice cream shop! Do kids today have the same impression that I have of trains? I don't know, but I do know that books about trains remain popular with them. I love the vagabond idea of them, I think...that ability to get on and let the tracks take you to your destination, and a myriad of others along the way. Kids will immediately be drawn to the fact that this train is peopled by animals, and has a caboose. You don't see those these days. 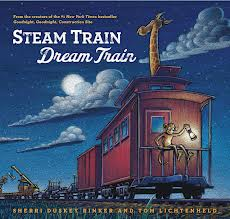 The bed on one of the train cars and the luminous night sky are our first hints that this is a bedtime story. Just look at the soft warmth of the moon's glow on the puffy dark clouds. A dinosaur and a bone...who doesn't want to know more? And the endpapers...a conductor's striped overalls, or a trainman's hat...memories were immediately evoked for me! The horizontal beauty of the dark night train puffing steam into the cloudy star-filled sky. Are you ready? so cargo can be poured inside. they get to work and have a ball. three boys jump in...and fall asleep." Just what they are meant to do! While sure to be enjoyed as a precursor to bedtime, little ones should not miss poring over the stunning artwork created in wax oil pastels by the marvellous Tom Lichtenheld. He fills its pages with vast skies, heady clouds, moonlit animal images and a quiet atmosphere that is sure to entice even the least tired of them to curl up and cuddle into a long night's slumber. with a couple of bears. One of the things I love best about sharing Mem' Fox's brilliant books with early readers is that there is no 'sameness' to them. That being said, they are the same in many ways...thoughtful, expressive, fun, perfect in every way for young children just embarking on the road to being independent readers. Using her books in the early grades to talk about the strategies that authors and illustrators use to teach us about writing was a successful and most enjoyable endeavor; rarely are the illustrators done by the same artist. 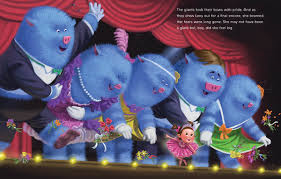 So, while Mem taught careful lessons about choosing the perfect word, using rhyme and rhythm to capture attention and to engage her young readers, the talented illustrators who created the visual story had very different lessons to teach about color, space, detail and line. I was full of anticipation for this new book when I learned that Laura Ljungkvist was chosen to help bring Mem's game of hide-and-seek to little ones. She is the creative genius who gave us the Follow the Line series of books. Take a careful look at the image-filled cover before you even open the book. It abounds with familiar images designed to capture interest and get young readers talking about what they see. A peek-a-boo circle shows a smiling ladybug preparing for the game to come. Open the first page to learn something important about that ladybug...she loves to hide. The game is on! A voice calls for her to show herself and another turn of the page reveals a water-filled bathtub and an assortment of familiar objects, only one helping to hide her from view. Each new answer is revealed with a close-up circle to bring attention to her hiding spot. Then, we are on to the next part of the game. Bold colors, numerous patterns and an astounding collection of shapes is meant to distract the reader from finding that little lady, while also encouraging keen observation. 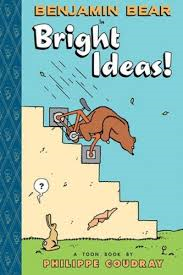 Repetitive phrasing and a jaunty rhyming text will help those who share this book to find success in their search. But, don't turn the page too quickly! "The birds were funny, noisy, and black and white, but they were nothing like Paul. 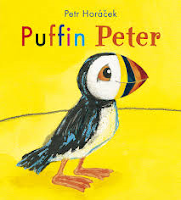 "Paul is not a penguin," said Peter. "Paul's beak is very colorful. "Funny, noisy, black and white, with a colorful beak," said the whale. "I know exactly where to look." And they set off again." We know about storms in Manitoba this summer....day in and day out they rear their ugly heads and have caused untold damage for far too many people and homes. Something similar happens to Peter and Paul, best friend puffins who are separated during a storm at sea. Peter is blown out to sea; when the storm subsides, he has no idea where Paul might be. As luck would have it, he meets a sympathetic and most generous blue whale who is willing to help him find his best friend. All the whale needs is a description of Paul. With each new detail added to Peter's description, the whale has an idea for where to find him. Of course, each detail pertains to one kind of bird or another - parrot, penguin, toucan. None fit the full description; however, the whale is not one to give up. Persistence finally pays off when they drift close to an island and spot Paul, safe and sound. Huzzah! 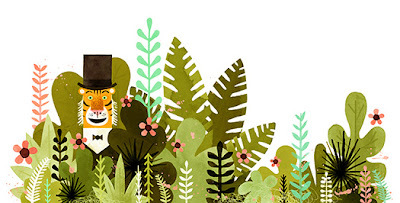 Petr Horacek creates bold and colorful art for this story of friendship and kindness. He uses mixed media to create textured, detailed spreads that burst with energy. He shows varied perspectives, action, and ever-changing settings as the two explore the marine world in search of Paul. I like the way he varies his perspectives to give his young readers a real sense of the vast expanse of the ocean, and the panels that first show the storm as it separates the two and then the discovery that brings them together once more. The ending is appealing, and full of charm. "The frog watched, mesmerized. And where you or I might have begun to suspect this little girl of being a selfish brat, the frog, not knowing many (any) humans, saw only a maiden who had somehow captured the sky and kept it jailed behind her eyelids. And he suddenly felt that if only he could spend the rest of his days in the presence of this beautiful creature he would be perfectly and totally happy." Are there plans being made in your family for a summer camping trip, a backyard tenting excursion, a feast of evening stories right at home? 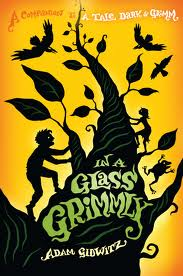 If so, you don't want to miss this companion to A Tale Dark and Grimm (2011). No longer retelling only Grimm fairy tales, Adam Gidwitz adds to his repertoire by introducing Hans Christian Andersen and Mother Goose to his eager readers. You will fall in love with the storytelling and the attention you get when you read them aloud to anyone who wants to listen. This set of tales has lost none of the exuberant style we so enjoyed in his first book. "I do not know if little children are reading, or hearing, this book. After all the revolting bloodshed with the giants, and then the goblins, not to mention the horrible scene with the mermaid and the drowned girl, I certainly hope they are not. This next part is not nice." The gross factor is upped and sure to please fans of the first book, while causing some degree of discomfort for others. But then, they don't have to read it, or listen to it either. Following their many described and intriguing escapades Jack and Jill return home, despite much adversity and terrific adventure, to tell their story and to mend fences with their oft-negligent parents. For those who love fairy tales and nursery rhymes you will recognize characters, settings and even certain actioms from the traditional tales. The characters are lively, the pace is quick, and the end result is a most engaging story to share at any time of the year. You will be charmed by it; you won't soon forget it. The best news of all is that you don't have to wait too long now for the third and final instalment. The Grimm Conclusion is due in early October this year. You will be sure to want a copy! "I watched my dad think about this. He looked like he was going to suggest that we have something for breakfast that you do not need milk for, like sausages, but then he looked like he remembered that, without milk, he couldn't have his tea. He had his "no tea" face. "You poor children," he said. " I will walk down to the shop on the corner. I will get milk." What a silly, silly story! Kids are sure to love it, and I think it would make a great readaloud for the first few days of school in a third or fourth grade classroom. Your students are sure to enjoy the inventive wordplay, the adventure and the crazy characters that people its pages. Mom has gone to a conference and has given explicit instructions to Dad, to be followed while she is away. One of her reminders is about milk...there is none! When there is nothing to pour over the children's cereal, Dad suggests orange juice. He then realizes that tea without milk will be disastrous. So, he makes the ultimate sacrifice of heading off to the corner store to get some milk for everyone to enjoy. "The odd thing was the beam of light that came out of the disc - a glittery, shimmery beam of light that was visible even in the daylight. And the next thing I knew, I was being sucked up into the disc. Fortunately, I had put the milk in my coat pocket. The deck of the disc was metal. It was as big as a playing field, or BIGGER." His story has only just begun. It involves everything that has happened to him in the time that he has been gone, and it involves space aliens, a stegosaurus and an air balloon, wumpires, pirates, volcanoes and time travel...back and forth, and forth and back. 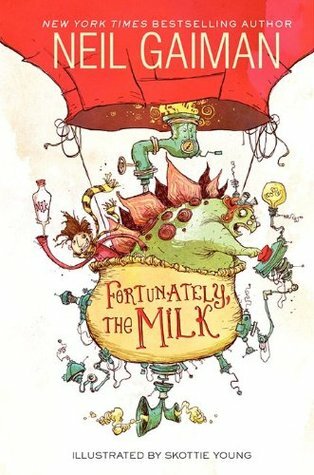 It is an inconceivable adventure and he regales his children with the danger, the trauma, and the fact that the milk has actually saved the world. Incredible? You will have to decide for yourself when you have finished reading it! The plot is nonstop action and carefully considered, the story is funny and the artwork created by Skottie Young only adds another layer of fun for the reader. Every kid has a dream of such adventure and excitement...it will be a blast for all, no matter the age, the time of day, or the ability to suspend belief for the time it takes to read it together. 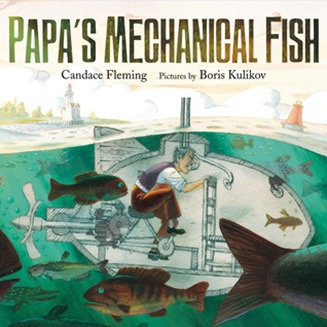 "Papa's mechanical fish is so small he barely fits inside. It has a tube sticking out the top so he can breathe. It has a pole sticking out the bottom so he can push himself along the lake floor. "I call it the Whitefish," he says. But will it work? We keep our fingers crossed. "Goodbye, Papa." We wave." As you will know if you have read this blog before, I love to share picture book biographies with teachers and with students. They are a perfect way to make us aware of people who have made interesting and often significant contributions to the world in a variety of areas. This is a fictionalized story which has its basis in truth. It is told by young Virena, daughter of inventor Lodner Phillips. Her papa is a inquisitive man who longs to create something of significance. Although he has never been successful, he doesn't give up. I think that is a lesson in, and of, itself. One day, feeling frustrated with his failures, and without the one single incredible idea needed, he suggests that the family go fishing. "Papa," I say as we wait for a bite, "have you ever wondered what it's like to be a fish?" "A fish?" he mutters. "A fish?" Papa's pole clatters to the pier. He leaps to his feet. He whirls me around. "Virena, you're brilliant, he whoops. Then he is gone, racing back over the sand dunes to his workshop." 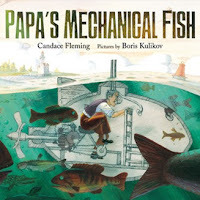 It is the beginning of a series of encounters between father and daughter that eventually ends with Lodner developing one of the world's first submarines. I love that Virena shows an aptitude for questioning the workings of the world in the way that most inventors do. Her questions are thoughtful and forward-thinking, encouraging her father to continue his work despite the many setbacks. A supportive family allows Lodner to keep trying to get it right. When he eventually creates a 'mechanical fish' that works, he is delighted and so are they all. Boris Kulikov does such a wonderful job of creating widely varying perspectives for this inventive tale. The many realistic details enhance the telling and offer young readers a playful look at the hard work it took to bring an 'incredible idea' to fruition. He uses horizontal panels to show action, close-ups of the fish that do not want to be caught but want to see what is going on, bird's eye view and cross-sections; all will encourage appreciation and discussion. Don't miss the family's French bulldog, and the part he plays in adding to the humor. An afterword and a source list add to the appeal. "It was after three o'clock in the morning when Paolo reached home. He was exhausted. Rosemary had locked the house up again, so there was nothing he could do but stay out all night and appear just before breakfast, pretending that he had gone for an early-morning stroll. He hoped his disheveled state would not arouse suspicion." Paolo loves getting out on his bike at night when he thinks no one else knows. His mother and sister Costanza do know, but they keep his secret. They wait patiently before sleeping until they know he is back home and safe. Paolo's story is set in Florence during the German occupation in World War II. It is a dangerous time for all who live there. Paolo's father is missing; his political views have forced him into hiding or risk being captured (and perhaps killed) by the ruling Fascists. The hills are filled with those working against the Germans in hopes that their area will soon be liberated. The Germans are desperate to maintain control. When they get word that Paolo's family may be harboring two Allied escaped prisoners, the Nazis prove just how dangerous they can be. They force their way into the villa and search it thoroughly. They are furious when they find no sign of the prisoners. After they have gone and while trying to make their escape into the city, David is captured and Joe is wounded. It is up to Paolo to get Joe back to the safety of the villa. The Germans return, and can find no sign of him yet again. There is great danger for Paolo and his family, and the action is relentless. You can almost feel the rumble of the tanks, hear the planes overhead and surely experience anxiety when Paolo sets off to seek help from the partisans. The Nazis are as menacing as you might expect, and the fear is palpable. It is a story of family courage, and shows that many people did heroic things during a terrible time in history. Exciting, and heartstopping at times, this is a book that tells a story from the war that Shirley Hughes has wanted to tell for many years. She was in Florence shortly after the war ended, when it was starting to rebound from the occupation. She had those scenes on her mind when she sat to write. She explains her interest in a detailed preface. Anyone interested in this time in our history will find the book hard to put down. "She was halfway to the house when she realized Jacob wasn't following her. He was scooping up dirt and leaves and nudging the baby squirrels into a roughly shaped nest in his hands. After he carried his bundle to the hollow stump and gently set them inside, Jacob moved to the shade of another tree on the far side of the house. From there he could watch over the stump." So, their life together begins. It is fraught with the worry that someone will come for him. As they spend time with him and grow to love him, it is the last thing that they want to happen. But, they know they live on borrowed time. Jacob is a delight, creative and communicative with the farm animals. The pastoral setting adds a calm, peaceful feel to the quiet action. At first, they are confused by the circumstances that bring Jacob to them. Then, as they grow to love him and realize how much wonder he brings to their lives, they begin to rue the day that those who left him will return to claim him once more. The uncertainty underlies all that happens in their daily lives. John constantly checks with the sheriff and in town to see if any child has been reported missing. The sheriff understands the unusual circumstances that are at play and encourages them to keep doing what they are doing for the young boy. When his father returns for him, they are left with a hole in their hearts and a determination to play a role in the lives of other less fortunate children. Always, they wonder about Jacob. You will wonder, too. What a remarkable read this was...heartwarming, quiet, lovely, full of grace and promise! Bravo, Sharon Creech. You have done it again! "I know Maddy says she has lots of animal friends in the woods. I know she says she once shared corn bread with a bear, the two of them sitting on a log. But I also know something my mother and father don't know. Maddy has powers all her own. Powers that other people don't have. Jack and Lizzie know this, too. They have met Maddy." How lucky was I to spend Monday with Patricia MacLachlan and Sharon Creech and their exceptional new books? In The Truth of Me Robbie spends the summer with his much loved grandmother. His distant parents are off to Europe on a tour as part of a classical music quartet. Robbie is sent to stay with Maddy while they are away. He loves Maddy wholeheartedly. His dog Ellie runs a close second, and he is allowed to bring her with him. Maddy is a consummate grandmother...she loves adventure, awes him with inspiring stories and even has a special way with the animals that live in the nearby woods. Not everyone loves Maddy's tales, but Robbie does. They may not be true, but he is not nervous as others seem to be. "If she does anything strange, you can call Henry," says my mother. Maddy always does strange things. And my parents are leaving me for two months while they go off to play. If they were really worried, they wouldn't leave me. Would they?" Maddy loves camping and being in the outdoors. Soon they are off with tent and everything necessary for a overnight camp. When things go awry and Robbie must seek help from Maddy's friend Henry, Robbie makes a welcome discovery. Ms. MacLachlan writes with elegance and heart. She creates characters that live long in our memories. Her stories continue to strike a chord with readers young and old. Heart, truth and love bind Robbie, Ellie, Maddy and Henry together in a charming tale of adventure and hope. The gentle ending bodes well for all of them...what could be better than that? "This is how you know you are on the express train to Trouble. You can't hear your lessons. You ask for the bathroom pass. You can't see your lessons. You ask for the bathroom pass. You can't taste your emergency mochi cakes. You ask for the bathroom pass. "Alvin," says Miss P. "Don't you think that's enough going to the bathroom for now?" 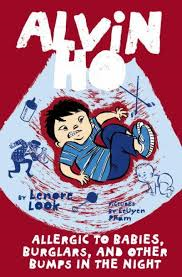 If you are an Alvin Ho fan, as I am, you will already know that this book is finally here! You know Alvin, and he's hasn't changed. He remains fearful, mute at school, an astute observer of the world he lives in and uproariously funny to boot. "...I heard Mom say that taking the test is the only way to know for sure whether you're pregnant." "Do you have to pee all the time?" Calvin asked. "Yup, he sure does," Anibelly answered before I could. She smiled. "He always makes it in time too!" "Not the kind you put in the car," Calvin said. "Have you gained weight?" Calvin asked. But he knew that I knew that he didn't have to ask." You can see where we are going! It's not just the baby that is a cause for concern. Alvin is also worried about an alarming number of burglaries in the neighborhood in recent days. Flea, his best friend, provides the much needed and appreciated Pregnancy Disaster Kit (PDK). Calvin creates an impressive burglar trap. Alvin provides the commotion. 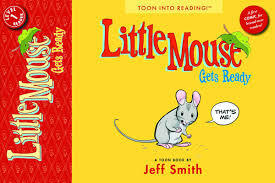 This is a wonderfully entertaining series for developing readers. There is enough repetitive language that they will find success in reading it independently. The dialogue is filled with fun, and angst, and silliness. LeUyen Pham's artistic renderings of the Ho family and friends add to the zaniness. "Lost Report Card Disorder - A fatal condition usually caused by mysterious circumstances that can never be explained. Symptoms include no report card, no sign of a report card, no memory of a report card, no hint that a report card was coming home, and sometimes the worst symptom of all: no clue whatsoever as to what a report card is, as in "A report card? Is that Chinese?" "Okay, you're not playing by my rules. like you in the whole world. When Ely's best friend Tommy dies, Ely is inconsolable. His beloved dog and Ely did everything together, and there is now a huge hole in his life! His parents are concerned and send him to help his grandfather on the farm as a way to take his mind off the loss. HIs sojourn at the farm is filled with so much action and adventure that he cannot help but have his attention focused elsewhere. Not long after his arrival, Ely is chased by bullies and finds himself in hiding in a deep and dark cave. Scary enough that he is in the darkness, he hears an unfamiliar sound. Later, feeling braver and wondering about the noise, he returns with a flashlight to discover a T-Rex! They quickly become firm friends. It takes some smooth talking and a lot of affirmative action to convince the mayor that Tommysaurus will not hurt anyone, and that he might bring prosperity to town. Randy, the resident bully, is an interfering and persistent antagonist. When he lights a fire near the dinosaur, Tommysaurus is terrified. His reaction is immediate and dramatic, and puts his security within town limits in jeopardy. Luckily, the dinosaur has a good heart and comes to the rescue when Randy gets caught in the fire. There are some real EWWWW! moments...and one that I found really gross, but it has heart, touching on subjects of loss, friendship, forgiveness. The ending is heartfelt and gently satisfying. 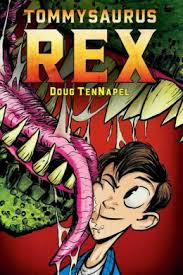 I don't often read graphic novels, but Doug TenNapel's Cardboard (Scholastic, 2012) made me a fan and I was keen to read this new one. I'm glad I did, and you will know those readers who will find satisfaction in reading it, too! "He is a creature of my niece, Athena. Not her creature in the sense that he is her child. Athena has no use for children, and the making of children. He is her creature in that he has a great mind, and is a hero. Athena collects heroes like my brother Hades collects names. This man, Odysseus, became a hero in the Greeks' war against the Trojans..."
This is the fifth in a series of graphic novels created by the incomparable George O'Connor concerning the Olympians. There are sure to be fans in most intermediate and middle grade classrooms. Once read by one, they will be passed from reader to reader. They are epic adventure stories! The Percy Jackson books by Rick Riordan have upped the interest for many, and the diehard mythology fans are sure to find this set of graphic novels intriguing and informative. Four others have been published prior to this one: Zeus, Hera, Hades and Athena. It's a great way to be introduced to them. I hope there will be more! "As a narrator, Poseidon never spells out what he's thinking directly, but I think you can get what makes him tick. He's a middle child, sandwiched between a distant older brother, and a younger brother who gets all the glory....Never doubting himself, he nonetheless feels keenly that he doesn't belong, and he can't place a finger on why." There is a perfect match between fantastic art and O'Connor's ability to tell an impressive story full of suspense. He has set the bar high in previous books and he assures that this one is a most welcome addition to the set. 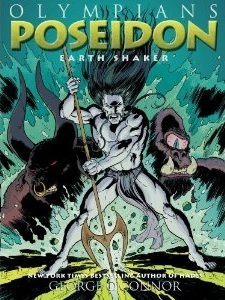 While there are references to characters from others in the series, there is no need to have read them before embarking with Poseidon in his undersea world. His love for his sons is emotionally evident throughout...those who cross them are sure to feel the wrath of the father! If you love graphic novels and you are looking for suspense, you have come to the right place! I hope you met these adventurous buccaneers in their first guide, A Pirate's Guide to First Grade (2010). If not, check at the library to see if you can borrow it, or buy a copy for your own library. This time Red and Molly are captains of competing teams in a swashbuckling caper on the playground at recess. Red is ahead as they race outside to make the most of the time given for dramatic undertakings. He's been daydreaming all the action as he waited for the recess bell to ring. Molly follows close at his heels as they explode onto the schoolyard. Then, it's adventure at its finest. Using spirited pirate language and a remarkable artistic style first seen in their initial guide allows the two young students to fill every minute of the break imagining life on the high seas. Each has a crew of their own. The pencil sketching used to create the pirate story is awesome, and will have listeners glued to their every move. I found myself 'reading' the real story first and then adding the pirate's part to the telling. I was keen to see everything in all of the detailed spreads. And the language just begs for the story to be read aloud...over and over again! "Alas, Red's crew had no stomach for swordplay. They shook in their boots most fearfully. "Call yourselves pirates?!" Red thundered. "Ye will fight, or walk the plank!" The imagination is an amazing thing in young children. 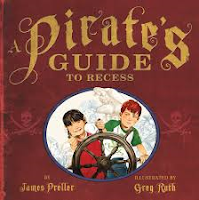 James Preller has created another stellar adventure that will captivate and entertain his audience while encouraging them to take to the ships and leave the landlubbers in their dust. Greg Ruth brings the pirates to glorious and gruesome life, and leaves readers always wanting more. And there's homework...to learn all the terms that have great importance if you are longing to be a pirate! Get to it, mateys! It's funny the ideas that small children have about the unknown. It's so interesting to watch them as they discover their world, forming impressions and making their opinions known. In this book about misconception, we meet Bear as he is awakening from a long winter's nap. The snow has disappeared. Bear dons his favorite red sandals and stretches his bulky body in the spring sunshine. That body is not as bulky as it once was, and Bear is soon feeling hunger pangs. His keen olfactory system senses nearby honey. A bee asks if he would like some. But, Bear has never seen a bee. He has only heard stories and is not keen to meet one as he knows that that they could not be friends, and that he has a strong dislike for them. His description is frightening. Poor Bee! It could be a disaster. This bee is pretty savvy, and sees Bear's ignorance of the situation as a perfect invitation to inform and teach. 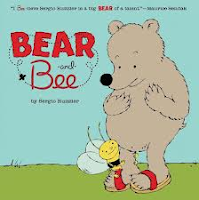 If Bear were to look at the many descriptors he uses when talking about the bee he has never met, he might find that most pertain to himself! Bear's response is immediate and will be hilarious to his audience. Once the bee clears up any misconception, the story proceeds to a most satisfying ending, literally and figuratively. The two newly acquainted pals find they have much in common, not the least of which is their mutual love of honey! Sergio Ruzzier uses a palette of blues, greens, and bold yellow to create the engaging spreads that will capture the attention of young readers as this story is shared. His story is spot-on for allowing discussion of fears concerning the unknown. His timing is pitch perfect and offers humor and a winning tale. "I can't wait to see the chickens in the barn. They drop lots of yummy seeds on the ground. Then I'll find the horses and eat all the OATS that they drop on the floor! There! Pants are NEXT!" Oh, early readers are going to love that they get to read a graphic story...just like the big kids! It's also a picture book, full of detailed images that are sure to please. 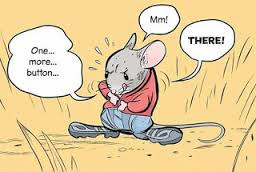 It's Little Mouse's job to get himself ready to go to the barn with the rest of the family. Mama is ready and needs him to be the same. It's an exciting time for all when the family makes an excursion of visiting there. "Now, let's see...The first thing to put on are the underpants. Check for the tag. That's the back. 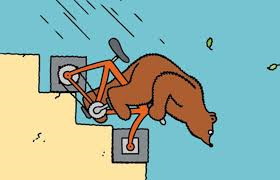 Just be sure to get your tail in the tail hole." "Well, mice don't wear clothes!" His clothing explodes off him, and away he runs...straight for the barn. Ah, the joy of freedom from constriction! This is a perfect book for children seeking independence in their everyday living. Energetic and charming, it will find fans in those who share it...or who can read it for themselves. While you have certainly heard this kind of argument before if you have spent any time with children, you need to see the graphic artwork that Philippe Coudray creates to make the story work and for you to get a real charge out of it! I have not yet seen the first Benjamin Bear book! But, I have no reason to believe that it will not be just as entertaining and wonderful as this one is! Each of the events is set on a single page in comic style. Each is a very, very smart short story which is also terribly funny. You will return to the stories again and again. I guarantee it! Every one is a delight...full of fun, easy to read (visually and textually) and always surprising. They happen in the outdoors, and most of them include Benjamin and other animals of the forest. There is so much to see and to appreciate. Each page has a title. They are perfect for those little ones just learning to read. But, the audience is much more varied than that. I found myself laughing out loud at some of the visuals, and will certainly be sharing it with anyone who should know about Benjamin Bear. 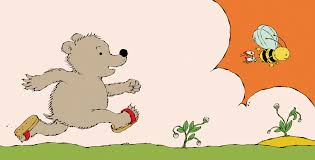 If you haven't seen Benjamin Bear in Fuzzy Thinking (2011) put it on your 'to be ordered' list as I am going to do as soon as I finish this post! "The new neighbor set up all kinds of gadgets and sculptures that were both modern and strange. After a few days it was clear the new duck intended to stay. Theodora prided herself on being a gracious bird. She was determined to make the best of a bad situation. It was time to meet this new duck." There is a pattern to Theodora's days. She rarely veers off course; and she is happy with that! She's busy, and accomplished, and settled. Then, Chad moves in next door. Chad has nothing in common with Theodora. Nothing! Chad is an artiste. He creates sculptures from objects others leave behind, or throw out. He colors his feathers. He is an avid dancer, is not mannerly, and talks a lot of gibberish as far as Theodora is concerned. Friendship is NOT an option! Her only hope is that Chad will soon fly south with all of the other ducks. No such luck. When the leaves have fallen, the pond has quieted, and the rest of the ducks have gone, she learns that Chad has hurt his wing and must stay behind for the winter. What to do now? He did not seem to notice the cold at all." As winter progresses, the two begin to find friendship and a genuine joy in being together. The telling is as unique as each of its characters. Readers will get the clear feeling that it is perfectly fine to be who you are. Despite their differences, both Theodora and Chad have a very clear style of their own. They may differ in many ways but their love of the stars is the glue that binds them together....one learning from the other and both enjoying time spent stargazing. Life with a friend is so much better than living a lonely life. Funny how that works so well when each thinks the other is 'odd'. There are so many tiny details to notice in Sara Varon's winning artwork. The characters are happy and settled into being who they are and it shows. Kids will love the graphic style. The palette of pastel colors works well and the changing perspectives will keep readers and listeners attentive and engaged. 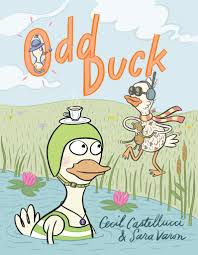 A gem of a book that is sure to be a hit with young readers! "She is smaller than I remember, and her hair is cut short and blunt. For a moment I remember her wearing an elastic headband to keep her long hair off her face while she cooked dinner or did the dishes or gave me a bath. But I don't remember the streaks of gray. Her eyes are taking me in, and they seem to redden with an immense pressure behind them. But she doesn't cry this time." 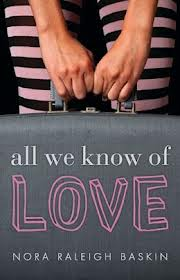 If you want characters to love, and love stories that don't always have a happy ending, this book will appeal to you. It is Natalie's story; but it also encapsulates the stories of the people she meets on an impromptu trip to see her long lost mother. Her mother left without a word four years ago. Natalie and her father have been doing their best to cope with her absence. As the story unfolds, the author gives us some glimpses back at those events that have defined Natalie's life. She has become adept at taking personal responsibility for the way things have gone. She thinks that her question about chocolate chip cookies was what really drove her mother to leave them. Her infatuation with the older and self-absorbed Adam leads to monthly pregnancy checks and the inability to find any real security in the relationship because she is sure she has done something that does not please him. An unrelenting check for messages on her cell phone should convince her that Adam has no loyalty to their relationship. She is looking for her mother to help her find answers to her questions about love. On the 24 hour bus ride taking her from her home in New York to the Florida address she found on a package from her mother she meets many people who give guidance and advice. She meets them in diners, in bus stations and even on the seat next to her during the trip. Each meeting is a lovely look at the goodness of those we meet along the way, and provide insight into relationships. Quite enlightening and uplifting are the people we meet along life's path! doesn't want to have to tell." Claire's poignant story is told, separate and apart from the contact between the two girls. This structure lets the other person think back on their own past, and each of the stories is concerned with love. Natalie's journey is at the heart of the book, and that never wavers. The writing is exemplary, and will certainly speak to a teenage audience. There are humorous bits, as well as heartbreaking pieces. Each contributes to the tone and appeal. It leads Natalie to make some important choices about her future, allowing her to change her life forever. Wordless books have so much to tell us; we can concentrate all of our attention on the story being told in the artwork. 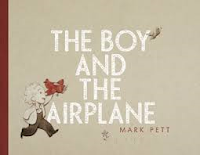 The little boy who graces the early pages of this new book by Mark Pett is on the receiving end of a gift that will change his life. We watch as he accepts it from an unknown someone, opens the package and heads outdoors to spend countless hours with his new airplane. A tiny bird joins in the fun. He throws it, chases it, and then throws it again. Oops! It lands on the roof, a problem that must be solved. A nearby ladder isn't long enough to be much help. A lasso, a baseball, a pogo stick, a fire hose...all net the same result. As he ponders the unsolved problem beneath a shady and comforting tree, a single maple seed flutters down and lands on his hand. Taking a spade to dig a hole, he plants that seed and then waits and watches its very slow growth. Through winter snowfall and spring budding, from small boy to grown man, then older man, and finally old, overalled, white bearded man, he spends his time watching his tree with hopes high and a plan in mind. Finally, he is able to climb the tree, and retrieve his beloved plane under the watchful eye of a friendly and curious bird. He gets long-awaited joy from flying it once more. One day when he is ready to launch it again, he has second thoughts. His solution is a perfect ending! Then, he exits the double page spread just as the giver had done so many years ago. There is a quiet charm, and lovely sense of patience to this art. The only color is given to the red airplane, while the rest of the illustrations are done in soft sepia tones. It is contemplative and calming as we watch the patience of the young boy as he grows to manhood with the plane always on his mind. This would make a perfect companion book to Oliver Jeffers' Stuck (Philomel, 2011). "Aunt Essy sat down in the big armchair with a sigh. Aunt Chanah groaned as she lowered herself onto one end of the sofa. Uncle Sam winced as he dropped onto the other end. "Oy," said Aunt Essy. "Feh," said Aunt Chanah. "So?" said Uncle Sam. That was all they ever said!" Telling family stories can be so much fun, or not! Cory Fagan proves that with this story of visiting relatives. They are old, and set in their ways. Their Sunday visits are filled with same old, same old...snarky responses to every conversation starter and always SO negative. "Oy," said Aunt Essy. "Crime these days." "Feh," said Aunt Chanah. "People are animals." "So?" said Uncle Sam. "Did you expect anything different?" "I was angry. More than angry. I stamped my foot. "I can't take it anymore," I said. basket. I put it on my head. "Oy," I said. "Oy, oy, oy!" And on they go! Mom and Dad are not impressed, but it certainly gets a response from their visitors. What a great family read this is! Cary Fagan brings his saucy sense of humor to this family story that will be enjoyed by those who have a chance to listen to it, or to read it themselves. 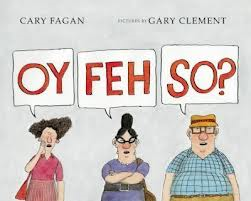 Gary Clement ups the humor quotient with his depictions of Essy, Chanah and Sam. He matches the tone of Fagan's story with the perspective changes, the expressive faces, and the single room setting. Our focus is constantly shifting and we feel we are party to their weekly exchange. The responses are blocked and large, allowing for repetition with a sense of purpose. I like that we see them coming and going, and are privy to the way in which the children respond to both. her fingers out of her mouth. hands out of her hair. to stop going on and on...."
You might remember Noni (Noni Says No, 2011) and her encounter with a friend who really liked being the boss. It took bravery on Noni's part to finally put her foot down, and do what she wanted to do without persistent guidance from Susie. 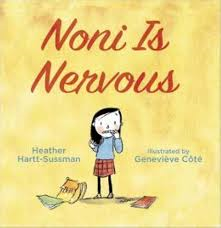 In this book about the fears that come as a new year at school begins, Noni has many questions and concerns. Her parents offer reassurance. Her little brother is not quite so accommodating with his advice as you can see from the quote above. He does just what most little brothers would do! She wonders what to wear for her first day of school, and where she will find a seat when she reaches the classroom, and if her teacher will like her; those are just her school fears. She also worries about global warming, and what it will be like the next time she plays with bossy Susie. There is no end to her misgivings. Fear is a way of life with Noni...thunderstorms, unfamiliar neighborhood dogs, monsters under her bed. At home, she was always comforted. The first day is a trial, and she shares with her family that in worrying about so much, she forgot to learn anything new! Her parents encourage her to be patient and to practice being more comfortable with the changes. A new day dawns, Noni tries to take that advice. Noni speaks to her bus mate Briar, helping to assuage some of those anxious feelings. As with most things that we try despite our apprehensions, the second day is much better and, at the end of it, it is up to Noni to allay her parents' fears for her! Genevieve Cote's watercolor illustrations are expressive and give young readers a real sense of the anxiety that Noni is feeling as she approaches her new year in a new place, with a new teacher and new classmates. You can see and feel her twisting her hair, and biting her nails, and worrying herself into blushing cheeks. All of that changes with time. Very real and oh, so charming! Wahoo! A new Elephant and Piggie adventure...sure to please and to teach us what true friendship is all about! Poor Piggie...she has a ball she loves and it is soon scooped away from her. Who does she turn to? Gerald, of course. He is always there for her, and he seems to have the perfect solution to any problem she might face. Gerald cannot believe what has happened...he is appalled. He will soon put the situation to rights. Big guys think they can do whatever they like to do, and Gerald is out to prove this particular big guy wrong on all counts. Off he stalks to make sure that what has happened to his friend will NOT happen again. The problem is that this guy is 'very BIG'! He's a whale! And he is not at all what Gerald has in mind as the creator of Piggie's problem. In fact, the whale is quick to offer his thanks to the pig for sharing her ball, albeit very small for him. He is a sad sack because no one wants to play with big guys like him. He is quite sure that it is the little guy that has the most fun, and he is heartbroken over it that observation. 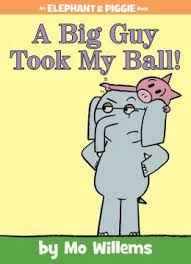 As happens with these tales of friendship, Mo Willems offers his young readers clues for how the book should be read. In this case, the whale speaks in upper case letters allowing for his very big voice, to accompany his extremely big persona. His illustrations offer every emotion felt by each of his characters. Speech balloons, differing fonts, expressive characters add to the charm and ensure that these beloved personalities will find pride of place on any home or school bookshelf. The pigeon continues to keep an eye on the action. Fervent fans will be thrilled to find him along for the ride, as he has been for every one of the nineteen tales. Bravo Mo Willems! Please keep them coming! "Why NOT on my bicycle? 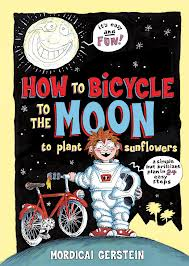 With a lot of serious thought, I secretly worked out a plan: I WOULD BE THE FIRST HUMAN TO BICYCLE TO THE MOON TO PLANT SUNFLOWERS. The plan was simple but BRILLIANT. But with homework, soccer, violin, and all the other stuff I had to do, I never had the time to carry it out. That's why I decided to write my plan down so someone else could try it." Ah, the imagination of children...what won't they think of? In this new fantasy by the beloved and prolific Mordicai Gerstein, we see just what a young boy can fantasize about when it comes to the moon and his bicycle. "THE FULL MOON always looked to me like a big, sad clown face. I asked my parents why it was so sad. "It's probably lonely," they said. "Nothing lives there." That's when the idea came to me." With a simple but brilliant plan to make the moon smile, he sets out to create a step by step manual that will help anyone make the trip to the moon and put it out of its misery. Just in case he can't do it himself, there will always be a fail-safe plan to follow. In a series of numbered panels, he takes the reader from bike to birch-topped trees and 'two thousand used truck inner tubes'; from a giant slingshot and a huge oak tree to a flagpole and a ship's anchor; and to a letter to NASA explaining his stupendous idea. There are twenty-four described steps, each one adding fascination to the fantastic fun-filled romp. "The earth will be the most BEAUTIFUL THING you've ever seen. It will keep getting smaller, while the moon grows bigger. When the moon looks bigger than the earth, you'll know you're ALMOST THERE." So much fun this book is to share, and then to hand off to children who will want to read it again, and take the time to really digest all of the instructions given. The illustrations add great delight, offering captions and speech bubbles that give readers pause to stop and look carefully at each panel. Be sure to keep your eye on the moon and its changing image.